If I were Bill Mauldin I would have a very deadpan caption for this. 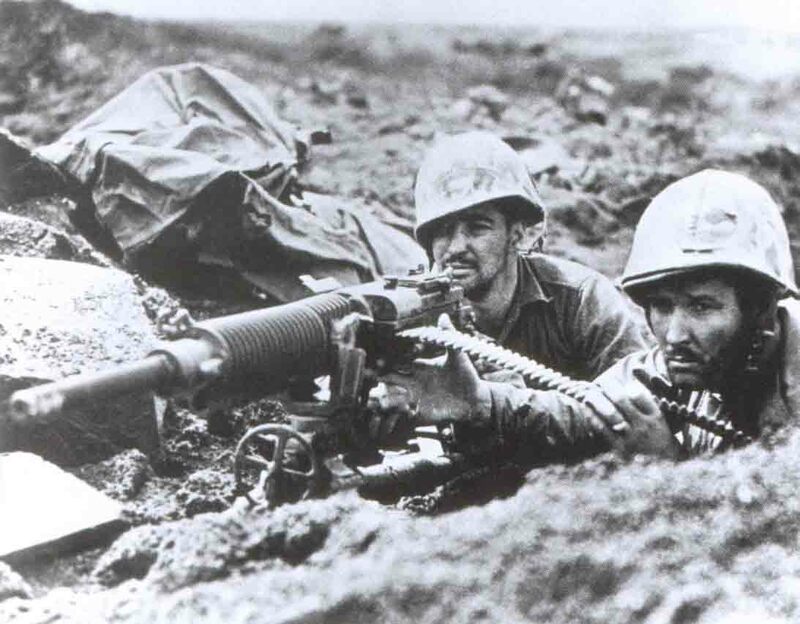 US Marines somewhere in the Pacific with a captured Japanese Type 92 machine gun. and did you go to The Protest? I wonder during the earliest period of the war how much our guys used captured weapons. I have read that when the navy had to pull back in the initial period of Guadalcanal that the Marines used a lot of the captured Japanese rice. Soldiers everywhere have always tried out captured weaponry, usually to see if they can learn more about their capabilities on the battlefield or if features of those weapons (sometimes even entire weapons systems) could be adopted for their own use, but sometimes just out of sheer curiousity. And, of course, there are those many situations where battlefield shortages of weapons, ammunition and other commodities have resulted in extensive use of captured enemy supplies. G.M., you’re right about the early days on Guadalcanal. The heavy, almost disproportionate casualties inflicted upon the U.S. Navy by the Imperial Japanese Navy during that period (due mostly to superior night-fighting capabilities and use of the famous Type 93 “Long-Lance” oxygen-powered torpedo, the American advantage in radar-controlled gunfire notwithstanding) did cause the former to temporarily pull back from the Solomons, resulting in an almost immediate and potentially acute shortage of supplies. The U.S. Marines, realizing the implications and not the sort of organization to waste available resources anyway, made full use of captured Japanese supplies, especially foodstuffs. The Japanese obsession with high-quality food, particularly seafood (which, to this day, constitutes the major part of their protein intake), meant that their foodstocks sometimes contained large quantities of excellent tinned crab and fish, which made a very welcome change of diet for the Marines when they could get it. The rice, being a staple carbohydrate, was also often a featured item. It should be noted that many Japanese did the same concerning captured U.S. weapons and food rations, particularly later in the campaign when they were essentially cut off and had to resort to living off the land and whatever they could lay their hands on. I like reading source material as I call it. Stuff written by the people who were there. This link goes to the diary of a Japanese soldier that was there on Guadelcanal and it introduced me to the knowledge of ‘powdered soy sauce”. G.M., thanks so much for the wonderful links! It’s really great to read up on historical materials that haven’t been tainted by wartime or post-war propaganda and perceptions. If anyone else reads this post, I would strongly recommend that they carefully peruse what G.M. has so generously shared. Bill Mauldin! Now there was a cartoonist with real empathy for the average serviceman who understood the terrible price of war yet never lost his ability to nearly always find a humorous side to things. If you haven’t had the time to do so, Bill Mauldin’s WWII Pulitzer-Prize-winning book, “Up Front” is still available on Amazon, complete with his cartoons of Willie and Joe…a truly timeless “Must Read” for any Grunt of any generation! And of any stripe, I might add. A near-perfect recommendation, to say the least. “Back Home” is a more important book. The two go together. So, this proves that Jap guns were not exactly ‘inferior’. Or is this just posing with enemy’s hardware? It’s hard to say for sure. On the one hand, the two U.S. Marines definitely appear to have been in combat for a prolonged period of time and simply do not have the aura of having merely posed for the photographer ; yet, on the other hand, the sights on the Type 92 are in the folded-down position, which would seem to indicate a discreet “cheesecake” shot. What could make this even more complicated is the fact that if they were actually setting up the Type 92 against the possibility of an enemy assault, many Japanese counter-attacks in the Pacific Theater were conducted at extremely short range, often at night, when open sighting with a machine gun would have been necessary. not so sure about the desirability of captured japanese foodstuffs on guadalcanal, my uncle was there and the only 2 things he would say about guadalcanal were ‘ maggots in the rice’ and ‘don’t ever underestimate the cruelty of a u.s. marine’… make of that what you will. I am not surprised your uncle has been so close-mouthed about his experiences on Guadalcanal ; as we all know, it was one of the most horrifying and brutal campaigns of World War Two, and most veterans, who are already naturally reticent in recounting their time on the battlefield, would probably be even more reluctant to re-live Guadalcanal ( and this applies to survivors on both sides ). The maggots in the rice resulted primarily from Guadalcanal’s hot, torrid tropical climate and intense humidity, coupled with primitive field conditions and little or no refrigeration. Dry, uncooked rice keeps very well for the long term in any climate — provided it stays dry. If rice gets wet and stays wet, it ferments quickly and spoils, especially in a tropical environment. The maggots ( fly larvae ), prevalent in any hot and humid climate, will follow naturally. Cooked rice can keep only for several hours when exposed to the same conditions before fermentation and scavengers take over. Even the freshest food will immediately attract flies when exposed. The Japanese had a very hard time keeping their rice stockpiles from spoiling under these conditions, particularly when the constant American pressure effectively disrupted their logistical processes. The canned food, on the other hand, kept well as long as the tins were undamaged. Not all Marines had access to these supplies ; rather, units that were able to capture local stockpiles were probably the first to utilize them ( or not ) as circumstances dictated. Thanks for the detailed notes (as always) on the problems of food supply to troops operating in tropical climates with very high humidity, Earl. I must add that canned food is highly vulnerable to such conditions though, especially if corrosion starts to affect the tins… Under such conditions, some very nasty forms of food poisoning can happen. Absolutely true, Ruy. That’s why I added the caveat “as long as the tins were undamaged” in the last paragraph. I’ve seen some pretty impressive forms of botulism occurring in compromised canned food during extended jungle warfare manoeuvres. On the subject of the difficulty of keeping supplies intact in tropical conditions, Ian Hogg (as I recall) made a number of observations in that regard. The Japanese typically used “Shimose” (picric acid) as a filling in explosive devices. Picric acid is highly reactive and in combination with the metal of grenade bodies, shells, etc., forms shock sensitive crystals which can detonate if handled. My aunt’s ex-boyfriend was in New Guinea(?) and said that they frequently came across crates of Japanese grenades which had disintegrated due to the climate. He said that they would throw a long loop of rope beyond the grenades and carefully pull on the ends in order to remove them from wherever they didn’t want them to be. If they didn’t go off from that, they [usually] wouldn’t go off if you carefully picked them up and disposed of them. Thanks for sharing that, Chris. The guys who had to dispose of old Japanese ammunition stockpiles must have been walking on eggshells the whole time. My father enlisted in the Marines in early 1942 and served in the Pacific Campaign and came home a Master Sargent. He never spoke much of the war but once when I complained about mom’s cooking. He explained how they were dropped off on Guam and the Jap fleet came back. The Navy couldn’t drop supplies so they had to eat worms, crickets, water bugs, and anything they could find. I quietly ate what I had. One of the quirks of Japanese machineguns was (until the advent of the Type 99) their need for lubricated ammunition. This is rather ironic given that the foreign originals from which they are derived almost never have such a requirement. I believe it was Hogg who wrote that this was due to an inability to hold the necessary manufacturing tolerances, causing headspace and timing issues. Given the chronic inability of the Japanese to domestically produce a reliable inline, water cooled aircraft engine, even using foreign products as models, this has a certain degree of plausibility.